With lovely light blue and cream tones, this handmade pottery dog treat jar is a must-have for your pampered pooch! Part of a bespoke dog dining collection, this designer dog treat jar is handmade to order for us by a family run potters who bring their expertise and craftmanship to dog treat storage. It is dishwasher proof and comes with a lid to keep the treats fresh inside and each one is unique due to the kiln firing process. 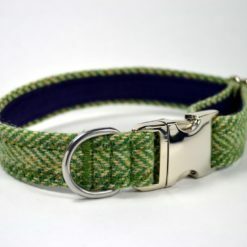 Our lovely sage green colour will complement most kitchens and your dog will soon love the sound of the lid opening!